Universal Studios most recent animated release Despicable Me with the voice of Steve Carell as Gru, a super bad villain who just became number two when a new Villain named Vector steals one of the great pyramids has a lot heart as well as laughs. 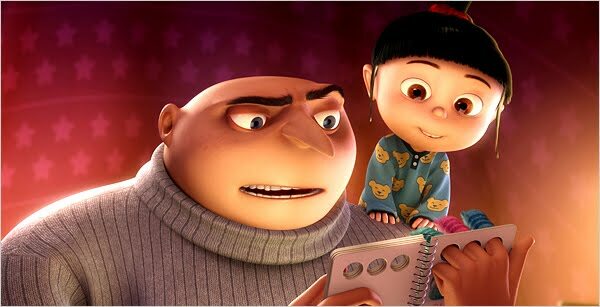 Through the course of the movie Gru's character make the transformation from a self centered villain with aspirations of grandeur to a selfless parent who realize that raising a child is indeed a grand undertaking with countless rewards. Along the way there are plenty of laughs from Gru's um.. Dog and his minions who slapstick comedy steals most scenes. The movie is predicable but well done. There are a few scenes of that may be inappropriate for children 4 and under. The girls are adorable especially the little one who unbridled joy can melt even the "despicable one's" heart. If you were on the fence about seeing Despicable me jump off and get to a theater you'll laugh, you'll cry, you'll boo, you'll hiss, most of all you'll have a good time.